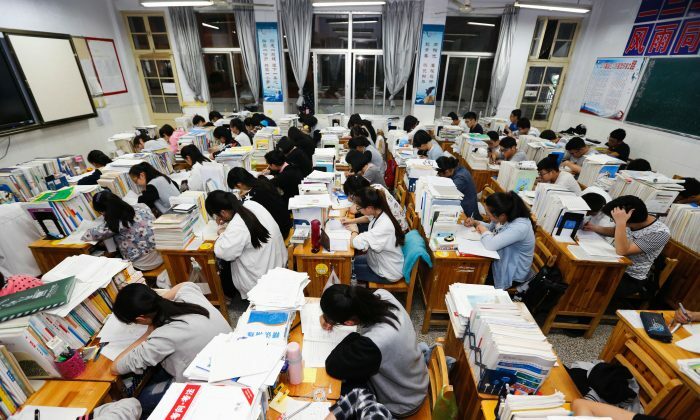 Guangya High School, locally considered one of the top four public high schools in Guangzhou, issued a notice in early March announcing that it had purchased 3,500 of the wristbands for students to wear, to track information such as their location, classroom activity, heart rate, as well as walking and sleeping data. Procurement documents circulated online indicate that the school spent 4.85 million yuan ($722,000) on a so-called “smart-campus” project, of which a large portion was allocated to the wristbands. According to the school’s announcement, the smart wristbands record attendance by monitoring students’ entry and exit of the school building. In class, it records how often a student raises his or her hand. It even collects data when the student is out of class, recording states of sleep and wakefulness. Wearing the wristband is compulsory, and its functions are integrated with a smartphone app that can be used by teachers and parents to monitor students and send them messages. A total of 351 schools in China are participating the “smart campus” project as pilot schools, according to “The Digital Campus Standard for Primary and Secondary Schools, Feasibility Study Stage,” issued last year by the National Center for Educational Technology, a division of China’s Ministry of Education, as reported by Radio Free Asia (RFA). One of the smart wristband suppliers, Ruijie Networks, a tech company in Fuzhou, Fujian Province, listed success stories on the company’s website on the application of smart wristbands, in which a number of schools are mentioned, including Zhenguang High School in Guangzhou and Nangong City First Primary School in Hebei Province. In December 2018, students in more than 10 schools in Guizhou and Guangxi provinces were required to wear chip-enhanced uniforms to track their movements and school attendance, also as part of the “smart campus” project. In May 2018, a high school in Hangzhou City installed cameras with facial-recognition technology to track students’ attentiveness in class. These cameras would scan students’ faces every 30 seconds to analyze their facial expressions and detect their mood. Each student was then assigned a score, based on how well he or she appeared to be paying attention in class. RFA contacted Zhenguang High School in a phone call. School staff declined to be interviewed, saying they needed approval from the local education department before speaking with journalists. The introduction of smart wristbands and smart campuses are part of the Chinese Communist Party’s (CCP) increasing efforts to surveil the population using high-tech methods. The CCP regime is building intricate files on Chinese citizens by tracking and recording their personal data, from political views to medical details such as blood type and DNA sequences. According to Guangzhou Daily, an online survey was conducted regarding the use of smart wristbands at schools. The opinion was divided, with about half of respondents saying the move had gone too far. “Every move is being monitored. Even prisoners are not treated this way,” one respondent wrote. Netizens commenting on the introduction of the smart wristbands and other monitoring systems expressed concern that students would suffer from stress and anxiety, due to being constantly watched.